Thompson Scale – Model 4693si Intermediate™ In-Motion Checkweigher | PMR Packaging Inc. The Thompson Scale Model 4693si Intermediate™ Checkweigher is designed for institutional and packaged food manufacturing, specialty chemical, and corrosive or caustic product industries. 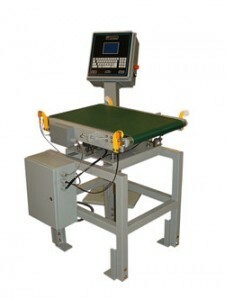 This in-motion checkweigher weighs products from 1 lb – 110 lbs (0.5 kg to 50 kg) with conveyor speeds in excess of 250 feet per minute, and production rates up to 60 units per minute. The Thompson Scale Model 4693si Intermediate™ Checkweigher is available in stainless steel or powder coated mild steel and is designed to meet the demanding production needs for an easy-to-clean, low maintenance, yet highly accurate in-motion scale. The 4693si Intermediate™ is a simple, easy to use, rugged, yet highly accurate production scale. Designed for flexible and hard-to-handle products, this checkweigher weighs products of virtually any shape or size. Examples of containers are boxes, cans, bottles, rigid shrink-wrapped packages, or flexible packages. Items compatible with the 4693si include paints, adhesives, insecticides, bagged and boxed sugars, raw meats, fruits, vegetables, chemicals, fertilizers, and caustic products. 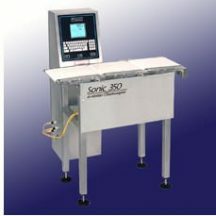 This checkweigher employs Thompson Scale’s Model 4693si™ Checkweigher Controller to provide the most extensive feature set with the highest possible accuracy. The controller provides easy to read menus with both English and Spanish in full sentences for better comprehension. It even runs a complete self-diagnostics with errors described onscreen. Its modular design and the fact that it is easily expandable to interface with virtually any line or management tools, make the 4693si™ Checkweigher and Controller a highly flexible and reliable solution to your checkweighing needs. A wide variety of weigh station conveyor lengths and widths are available to meet your specific application needs. Metering, pacing, reject, and material handling conveyors are available as well. 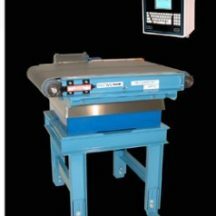 Its standard I/O will interface to your new or existing metal detector, with the 4693si™ Checkweigher offering control of up to three reject devices for low/high/metal reject outputs.